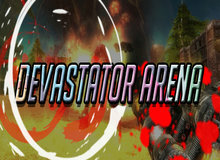 Devastator Arena was available as a giveaway on January 25, 2019! The distant future. 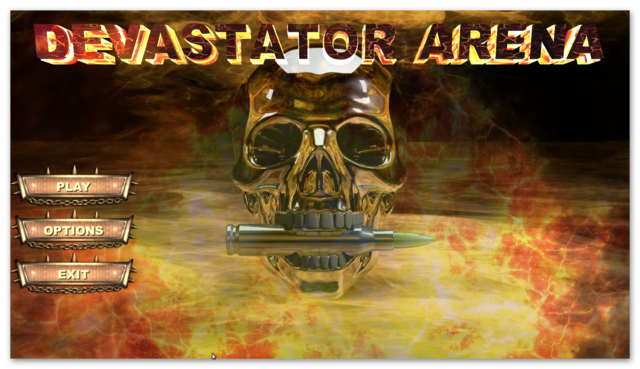 Shrouded with a sandy veil the burning desert hides a terrible place called Devastator Arena. This is the last refuge for maniacs and assassins of all stripes, who are brought here into this bloody slaughterhouse. Infected with a deadly virus, they lost their mind and turned into terrifying, disfigured creatures. And you are a Devastator. In fact, the same kind of criminal, doomed to death. The only difference from other creatures is the availability of weapons and the presence of the contract. The contract is to kill as many creatures as possible, and your family receives money after your death. It is a dynamic, hurricane-like 3D Shooter. 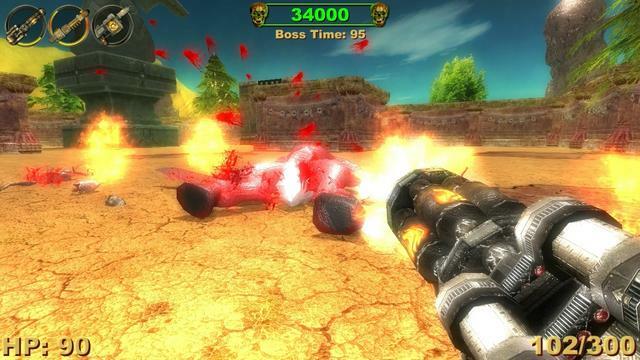 Destroy crowds of enemies with a machine gun, an acid gun, and a grenade launcher. 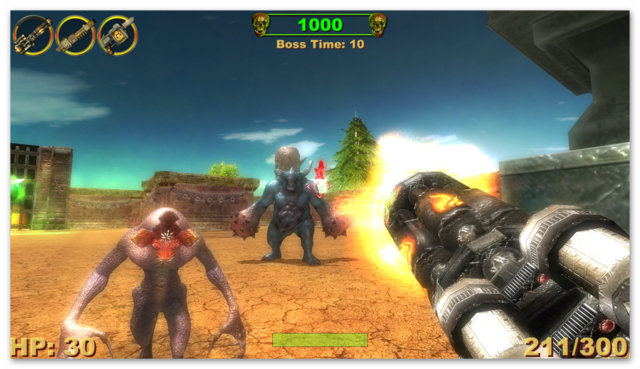 Kill the huge bosses and set your survival record in the online high scores table! I'll update this game as and when I get time to play more. as yet I've only found one level design and would like to see if there are more levels available. 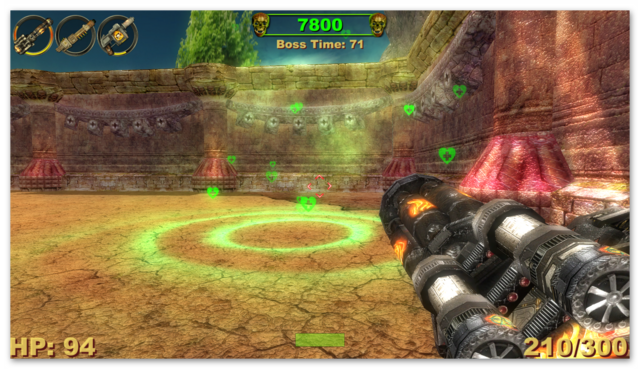 A run and gun arena style shooter. 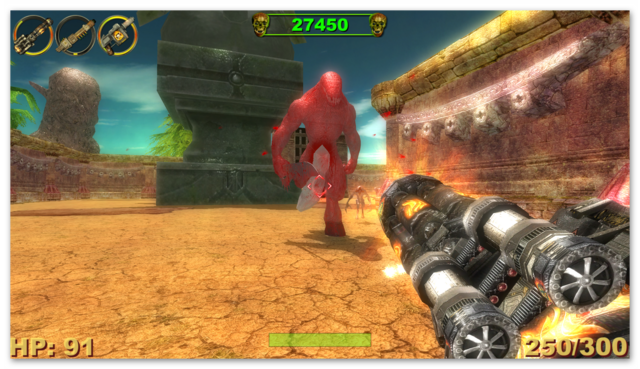 If you like run and gun over the top shooters like the Serious Sam or Painkiller franchise's, this is definitely worth downloading. 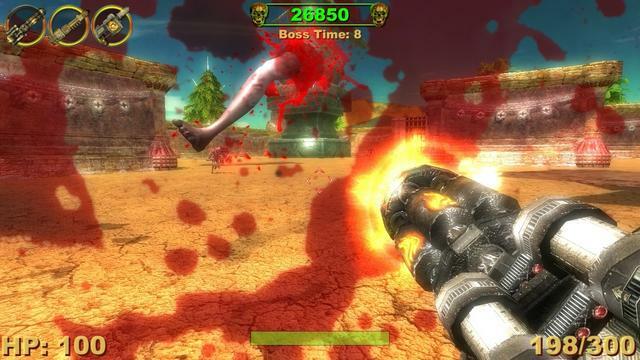 It has a never ending waves of monsters, lots of violence, loads of blood, gibbets and bullets flying around, with boss battles. However, if you prefer a different path for installation for example I use G:\Games\ name of game instead of 'C:\Program Files (x86)\MyPlayCity\name of game'. You can edit the default path when the Setup - Devastator Arena - Select Destination Location window appears. 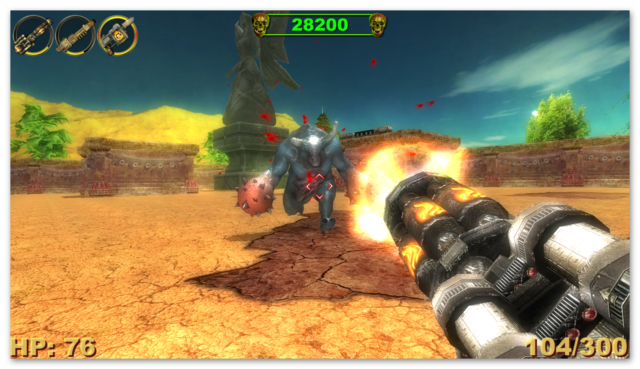 The aim of the game is to survive as long as you can, with endless waves of monsters attacking you. These appear from gates that can be found in each wall of the arena. 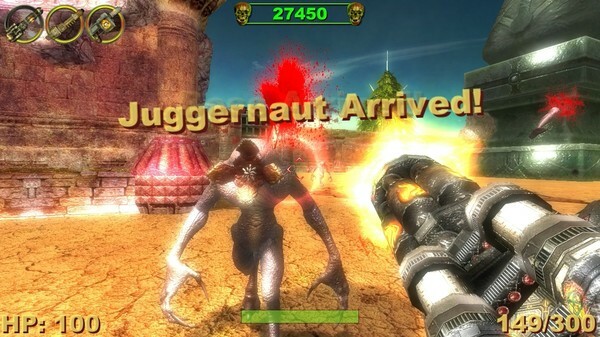 Apart from the standard monster, that is easy to kill (3 short bursts from the machine gun will do the trick, or one shot from the acid gun that dissolves your enemies or the grenade launcher); however, other monsters such as the Juggernaut, Boss or flying creature are more difficult to kill. You need to keep an eye on your health and ammo count at all times. I died several times simply because I kept running out of ammo and didn't realize that there was a restore point, that gave you health and recharged your ammo; (there are no instructions included with this game). This appears at different points throughout the arena. 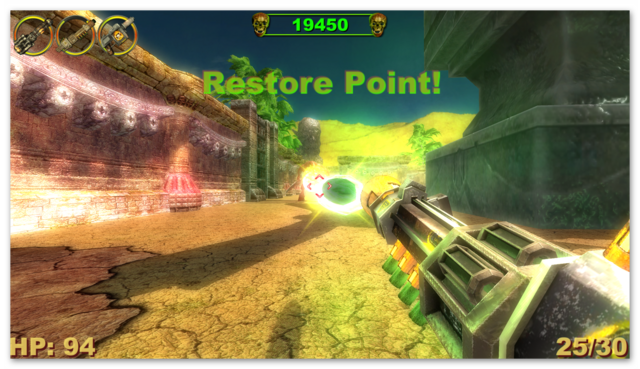 To regenerate your ammo and health you just need to stand inside the restore point, which can be seen as a green glowing cloud with hearts. 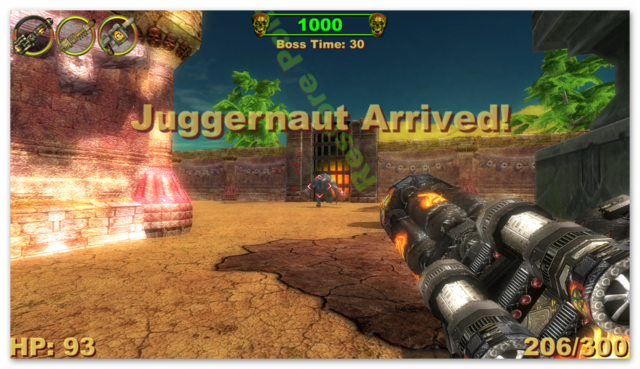 You are give a warning when the juggernaut and/or boss appears. There's also a countdown to when the next boss appears. You are provided with three weapons a machine gun that holds 300 rounds, an acid gun that holds 30 rounds and a grenade launcher that holds 12 grenades. 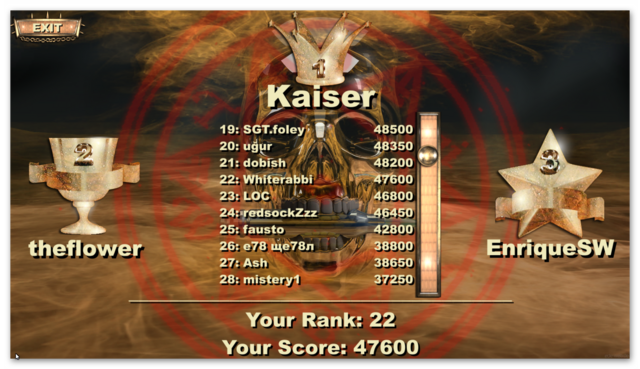 When you die you are given the choice of uploading your score to a world rankings list. After around an hours worth of play I managed to get to 22nd in the world rankings with a score of 47500 points, the number one world ranking was 122500. I did enjoy the game in small doses; however there isn't much variety in monsters or level design, so became bored of the game very quickly. 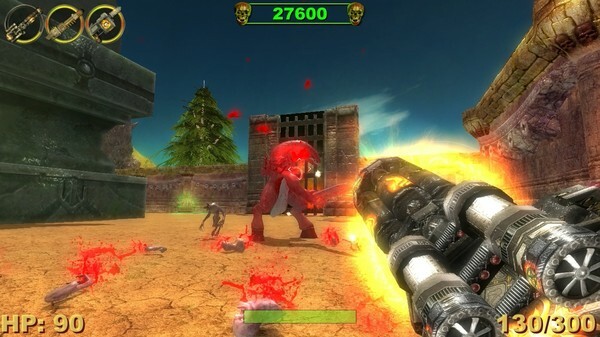 I already have all of the Serious Sam and Painkiller games, which are much better versions of this type of game, but that said, it is okay and worth downloading if you like arena shooters.I'll probably play it again just to see if I can get higher in the world rankings table. 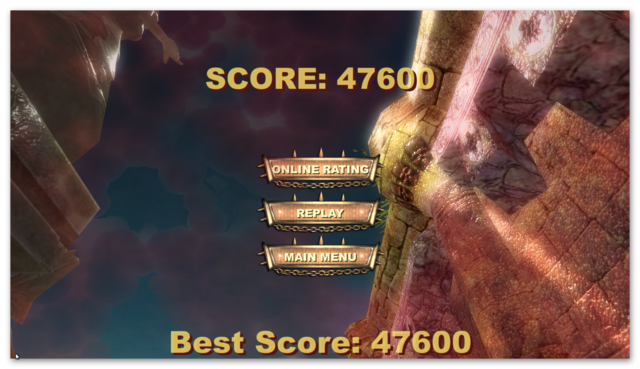 I doubt I'll get much higher 5hough as at the stage I died the number of monsters spawning had increased significantly. As you lose health, you also lose the ability to run fast and I wasn't able to get to the restore point, which shifts randomly around the arena. I don't know yet whether there is any other level designs apart from the single arena that I've survived in so far. The game would be much improved if there are more level designs and a greater variety of weapons and monsters and the ability to remap your keyboard bindings. 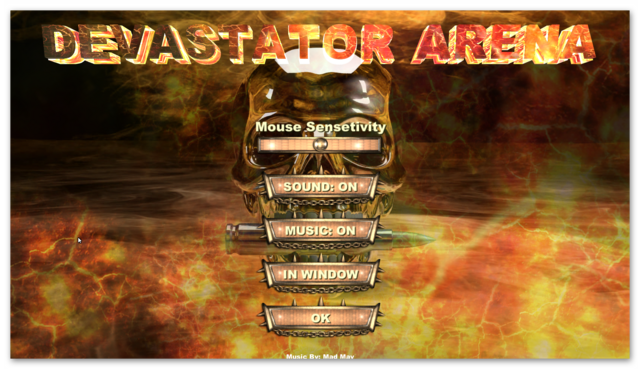 You can see other comments of Devastator Arena HERE (mainly positive). You can see several in-game videos of game play HERE, HERE, HERE (русский), HERE (Français), HERE (Deutsche) & HERE. If you're having problems installing or activating or getting Devastator Arena to work please visit the FAQ's Thread HERE and read through the communities comments because sometimes fixes have already been posted, for example, a common issue seen since the Themida wrapper was introduced three years ago is that some community members installation of the game are blocked by their security because Themida code has been known to hide malware, (usually an error message is flagged for example 'The executable is corrupted' even though in reality it is not); so as a precaution some anti malware programs will block and even delete the suspect installation files even though the files (i.e. the setup, read me and setup.gcd files are actually totally free from malware. This issue can be solved either by rebooting your computer in safe mode with networking or a quicker method is to temporarily turn off your security software to allow the installation. You could also try white listing the setup.gcd file. In the almost 12 years this game giveaway site has been operating there has 'never' been a game given away that was infected with malware. If Devastator Arena doesn't interest you, but you still hanker for something new to play, you'll find details of some game deals whether they be sale items, indie bundles or games being given away for free HERE (I've not updated the thread in a while, but most of the links still take you to the latest deals). The rest of the information that used to be posted in the game review can be found in the forums HERE. Finally, check out Delenns threads for details of other free games and offers HERE and elsewhere in the game discussion forums HERE, (usually on the first page of the game discussion forums). There are some limited time deals available at this time, but you'll need to hurry to get them e.g. Deponia: The Complete Journey an excellent point and click comedic steam punk game.